The HSMC-950 and HSMC-951 are High Speed Mezzanine Cards (HSMC) providing both HyperLink and Low Voltage Differential Signaling (LVDS) connectivity designed with controlled impedance PCB traces. The HSMC-950/HSMC-950 are designed to provide connectivity between HyperLink enabled Texas Instruments DSP EVM boards and FPGA based development platforms with HSMC connections. HyperLink consists of both low speed single ended signals and high speed differential signals. The low speed sideband control signals consist of 4 sets of unidirectional LVCMOS clock and data pairs used for power management and protocol flow control. The low voltage regulators and level shifters safely adapt the LVCMOS to the varying FPGA I/O voltage standards. The high speed pairs are PCML-compatible clock data- recovery SERDES pins . 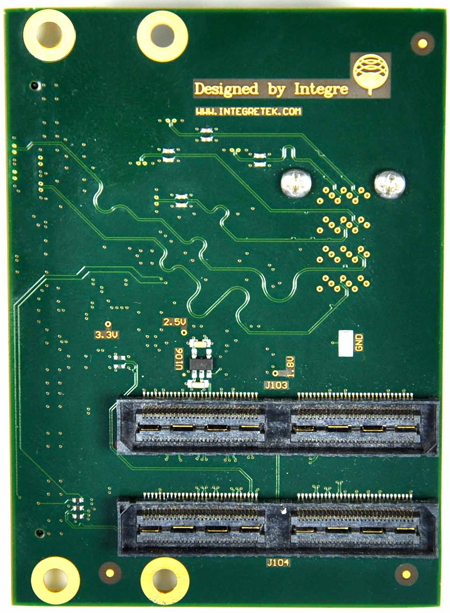 The HSMC-950/HSMC-951 also supports two LVDS Analog Front End (AFE) input connectors which are routed to the FPGA mezzanine connector. The AFE connector signals consist of 9 pairs of source synchronous DDR LVDS data and a sample clock. 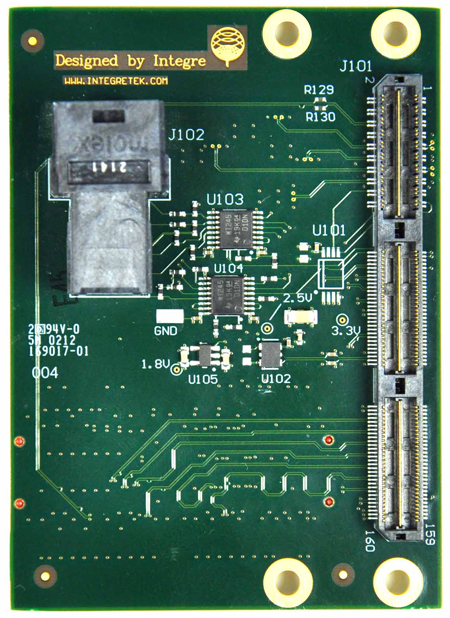 The HSMC-950/HSMC-951 AFE connections are specifically designed to adapt the physical electrical connections of up to two of the Texas Instruments AFE EVM’s such as the AFE5808EVM Ultrasound AFE board. AFE support is dependent on the FPGA carrier board’s I/O resources and is not guaranteed for all platforms. The HSMC-950 and HSMC-951 support different HSMC quad serdes lane wirings. Contact Integre to determine which connectivity card is best suited for your hardware platform.